There has been much discussion over the past several days about the many contributions former President Gerald Ford made to the American political experiment. Surely, his was a steady hand at the helm of a ship of state that Richard Nixon had steered into turbulent waters. And, surely, the grand old Republican's moderation was a necessary corrective against the sort of ideological abuses committed by too many of his fellow partisans. But Ford's greatest contribution involved the brief restoration of the system of checks and balances that the founders established in order to protect and maintain the Republic. A man of Congress who came to the Oval Office by the accident of appointment rather than the design of candidacy, Ford moved in the first months of his presidency to renew proper relations between the executive and legislative branches. Critics may suggest that Ford exceeded his powers as president with his decision to pardon his scandal-plagued predecessor. While presidents are afforded the authority to grant pardons, it is certainly reasonable to disagree with the decision to clear Richard Nixon before Congress and the courts were done with him. It is impossible, however, for anyone who cares about the right working of the federal government to disagree with what Ford did next. After he pardoned Nixon "for all offenses against the United States which he ... has committed or may have committed or taken part in" while his disgraced predecessor occupied the Oval Office, the 38th president voluntarily appeared before a subcommittee of the House Judiciary Committee to testify under oath regarding his decision. Contrast Ford's respect for Congress with the belligerent disregard for the institution shown by members of the current administration. Vice President Cheney, Ford's former White House chief of staff, has been particularly foul — not to mention foul-mouthed — in his rejection of congressional oversight. In mourning Ford's passing, Cheney referred to the former president as his "mentor." Fair enough. If the current vice president has honest regard for the model established by his former boss, Cheney should honor Ford's legacy by accepting the invitation of incoming House Judiciary Committee chair John Conyers, D-Michigan, and several of his colleagues to testify before Congress regarding the role played by the Office of the Vice President in 2003 moves to punish former Ambassador Joe Wilson. The request came last year, when it was revealed that Cheney was actively engaged in efforts to undermine Wilson's credibility after the veteran diplomat revealed that the White House had inflated the "threat" posed by Iraq before the U.S. invasion of that country, there. Those efforts appear to have included a move to expose the identity of Wilson's wife, Valerie, as a CIA operative. "In response to significant public scrutiny, President Gerald R. Ford came to Capitol Hill on October 17, 1974, to testify before the House Judiciary Committee's Subcommittee on Criminal Justice on why he pardoned President Richard M. Nixon," Conyers, incoming House Government Reform Committee chair Henry Waxman, D-California, and New York Democrat Maurice Hinchey wrote to Cheney last year. 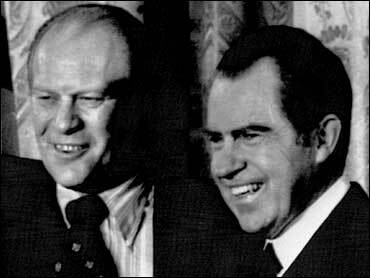 "At the time of President Ford's appearance before Congress, you served as his Deputy Chief of Staff and later became his Chief of Staff. With that precedent in mind, we respectfully request that you make yourself available to appear before Congress to explain the details and reasons for your office's involvement — and your personal involvement — in the disclosure of Valerie Wilson's identity as a Central Intelligence Agency (CIA) operative." Ford knew he owed the Congress — and, by extension, the American people — an explanation for his actions in 1974, and he provided it. By willingly offering that explanation in testimony under oath to members of the House who had the authority and the position to question him respectfully but frankly, he undid at least a measure of the damage done by Nixon during the Watergate years. Cheney and other members of the Bush administration owe the Congress — and, by similar extension, the American people — an explanation for their actions not just in 2003 but since 2001. Without a show of respect for Congress similar to that provided by Ford three decades ago, the damage done to the system of checks and balances by the Bush-Cheney White House will deepen and darken into not just a cancer on the presidency but a threat to the Republic itself.